For children over a certain age (usually around age 4 or 5), parents are required to handle all bathroom needs. 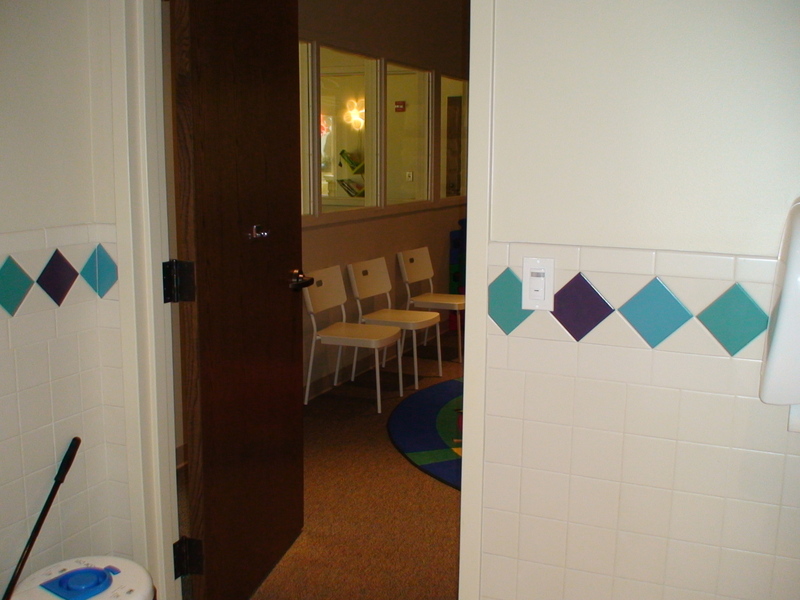 Some churches provide a family restroom adjacent to or nearby the special needs classroom. One church even installed a large shower inside their family restroom, to help with any emergency clean-ups. Parents may be asked or reminded to toilet their child at the Sunday morning drop-off. If a need were to arise for a diaper change or pit-stop during programming, the parents would be notified by beeper to come tend to their child. This policy always receives blessing from insurance companies, and both the probability and perception of abuse are kept at a minimum. A secondary benefit to this policy is that prospective volunteers feel less threatened/scared about serving, knowing that diapering duties will never fall under their responsibility. I know of at least three churches with comprehensive special needs inclusion programs that have adopted this policy. In all three cases the policy was developed after extensive conversation with the church’s insurance company and/or legal advisor. For churches that can afford the added expense of hiring a nurse through a third-party agency, this is a wonderful option. This hired nurse can tend to toileting/diapering needs during church programming. And the nurse’s employer (not the church, but the contracted agency) assumes the responsibility for screening, training, bonding, and insuring the medical professional. As with Stonebriar Community Church, the special needs ministry coordinator handles all toileting/diapering needs of the participants. A second female adult is required to be present during all diaper changes or bathroom visits. Parents and volunteers are notified of this policy. Parents may choose not to have the designated church employee toilet/diaper their child and may do this themselves if they prefer. No volunteers are ever tasked with toileting/diapering requirements during regular church programming. This picture is looking directly at the sensory board (dicussed in this earlier post) and shows the bathroom to the immediate right. Directly to our back is the suite and classroom entrance. 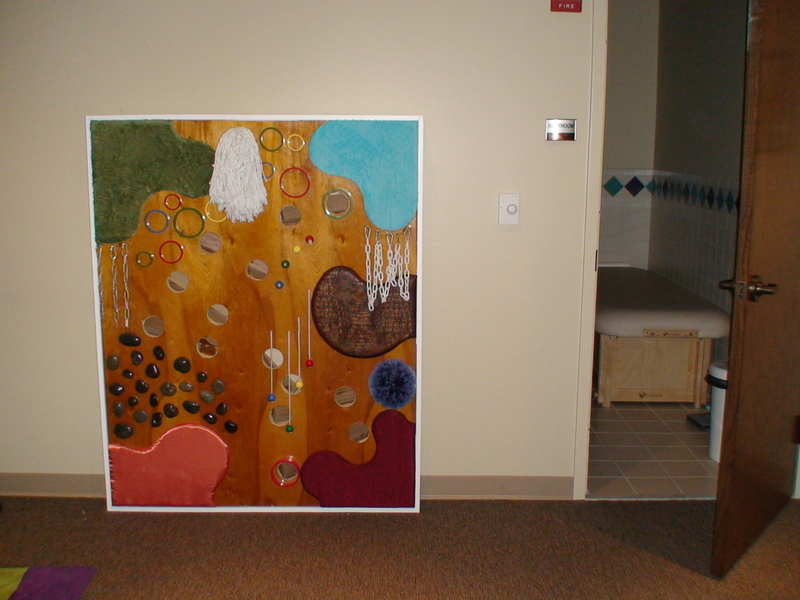 To the immediate right of the bathrooom is the sensory room. The size of this bathroom is large enough to accommodate a wheelchair or walker at the same time as having 3 adult-sized occupants (the student + two caregivers). Meaghan shared that this changing table is actually a massage table. 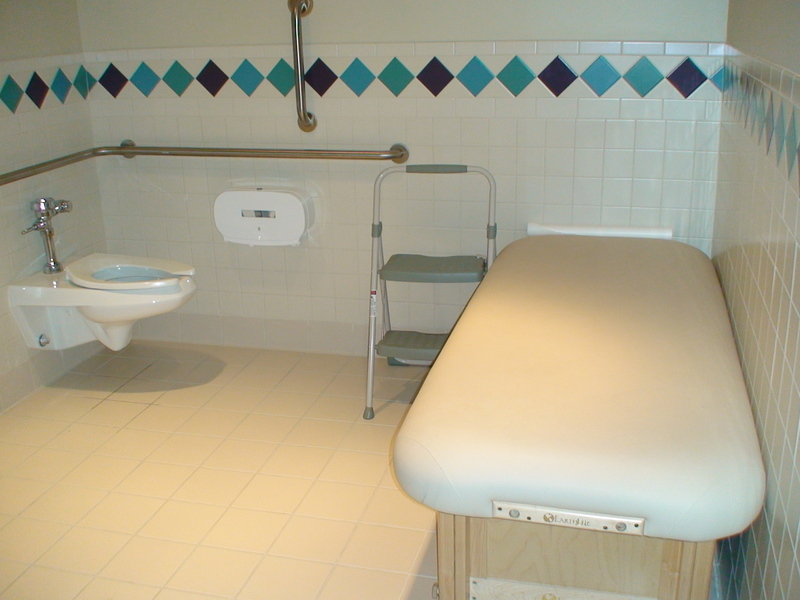 Examples of mobile changing tables to use with individuals with special needs can be found here. In this picture you see a Diaper Genie. Meaghan shared that the smell of a diaper is unpleasant to anyone but especially to students with sensory challenges. It is very important to develop a disposal method that adequately clears the air in the bathroom and the rest of the class area. As we were talking about the issue of smell and sensitivity, Meaghan shared that she advises ministry volunteers not to wear cologne or perfumes. Smells that the typical population may find pleasing can be disturbing to an individual who is sensitive to any scents or who has allergies. The only sink in the special needs suite is inside the bathroom. Meaghan explained that sinks can be a distractor for a participant who has a fascination with water. 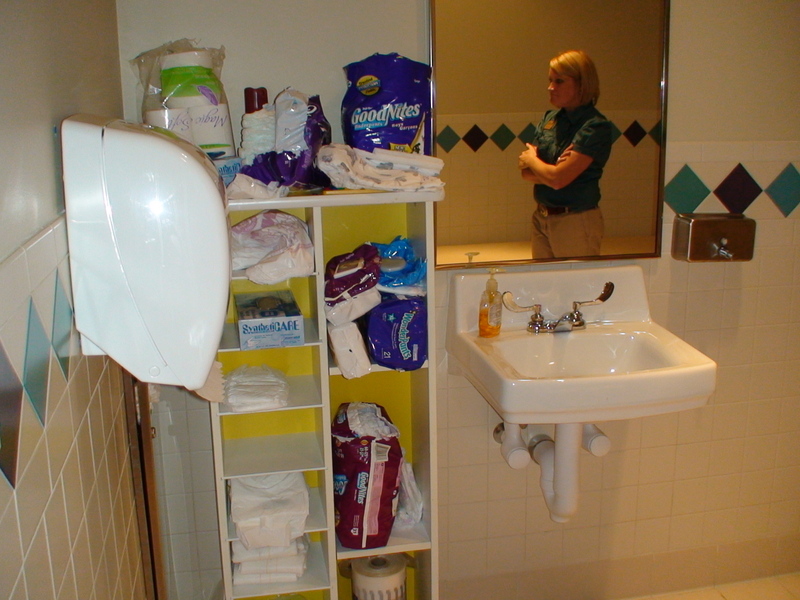 In this picture you also see a number of supplies the church keeps on hand inside the bathroom (diapers of various sizes, protective disposable gloves for diaper changes, and wipes). The door to the bathroom does not have a lock. The door is kept open at all times except when the bathroom is being used. In cases where Meaghan needs to assist or change a student, another female worker is present in the bathroom so to stay in accordance with the two-person rule (two unmarried adults are present through toileting/diapering situations). 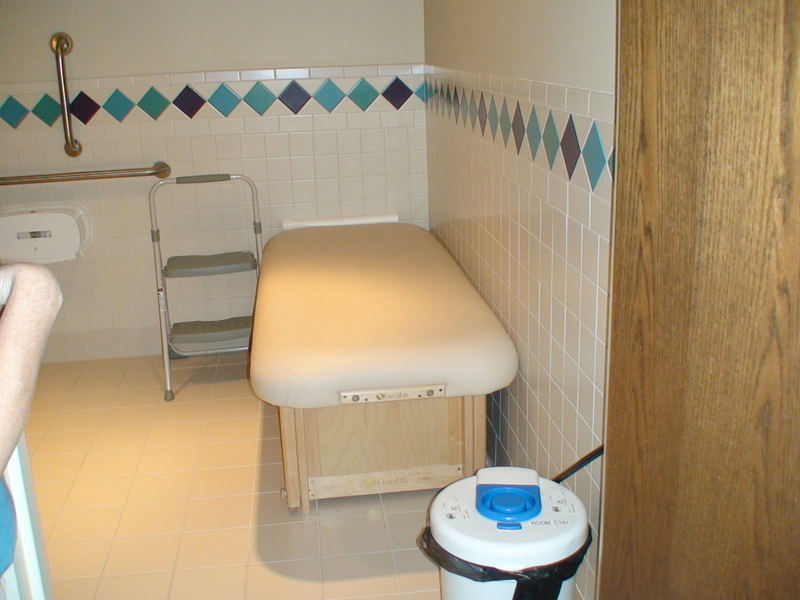 How does your special needs ministry handle toileting issues? We’d love to know what works inside your church.